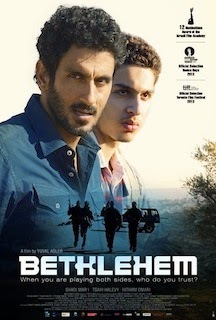 Movie Review: Israeli Yuval Adler has an auspicious debut on direction and screenwriting with “Bathlehem”, a thriller with dramatic tones centered on Israeli-Palestinian war. The story is centered on disoriented teen Palestinian Sanfur, whose fugitive brother, Ibrahim, is the Al-aqsa brigade leader of Bathlehem who became a symbol of Palestinian resistance after killing 30 Israelis. Unlike his brother, Sanfur is seen as a useless fighter by his father who only praises Ibrahim, and that fact is on the base of why he agreed to collaborate with Razi, an Israeli secret agent who trusts him like his own son. When Ibrahim is killed by an ambush organized by Razi, everything changes, not only in their relationship but also inside the Palestinian forces whose intern crisis triggers an intimidating conflict among the Palestinian Authority, brigades Al-aqsa and Hamas. Needless to say that Sanfur, moving dangerously on both sides of the fence, will be confronted with a final decision after has been detected as an informer – or he escapes to Israel, or he kills his agent friend to save his honor and become a martyr. Tension is everywhere and is delivered at a regular pace, while betrayals and impasses are a constant throughout the film, mirroring the huge complexity of a devastating conflict. In this aspect, we can compare it with Hany Abu-Assad’s “Omar”, which I found more involving and thrilling. In turn, “Bethlehem” is more raw and direct, and not less disturbing in its conclusions. It won six prizes from Israeli Academy, including best film, director, and screenplay.